Back Row L to R: Alayna Orgeron, Evvie Franklin, Cale Buchanan, Hannah Mills, Ann Brilye Hankins, Lottie Ann Stokes, Head Coach Missy Coppage, Team Captain Joi Williams, Samantha Stokes, Quinteria Sutton, Mercedes Benzing, Abigail Stokes, Chloe Oakes, Ava Hughes. *Developmental and Competitive Team Members are chosen by annual try-out/Invitation Only. Try-outs are held mid-Spring each year. 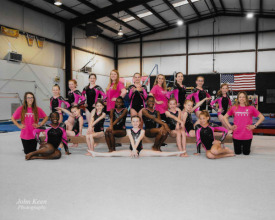 Delta Explosion team members in Junior Olympic levels 1-5 compete USA Gymnastics compulsory routines. J.O. Levels 6-10 compete optional routines choreographed for them by our staff. Delta Explosion also competes in the Xcel progam with athletes in levels Bronze-Diamond. Team members work out between 6 and 9 hours a week. They compete in 6 meets throughout the state of Mississippi including the State Championship every year. Our competitve season runs October-April and athletes are required to participate year round. Athletes chosen for team must demonstrate positive attitudes and a strong work ethic, along with strength and ability to BE coached. All athletes must first participate for 1-2 years on our Developmental Team before they have the possiblity of being invited to join the full Competitive Team. Developmental Team (formerly called Pre-Team) is our developmental class preparing gymnasts for joining our full competitive team. These athletes compete the level of Xcel Bronze and work out between 4 and 6 hours a week. They compete in 2 in-state meets per year and they have the option of competing in the State Championship. Athletes chosen for Developmental Team must demonstrate strength, a positive attitude, and must be able to listen to directions and learn.